I was not prepared for the quantity of food served at the ryokans. 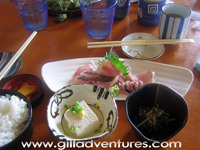 Traditional Japanese meals include a vast variety of fishes, seaweed, pickled vegetables, tofu, and rice. 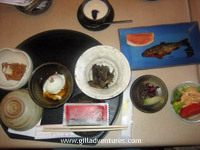 I had known to expect fish and rice for breakfast, and fortunately all four of us really like Japanese food. When the girls were very little, we discovered that the local sushi bar was loud, drowning out their little kid antics and making it a popular night out for our family. While staying at the ryokans, however, I had not expected to feast at every meal, particularly dinners. There is something about the little dishes and multiple courses that make it seem like a lighter meal. We have often fallen into this trap at home, either with sushi or dim sum; “grazing” until we’ve seriously overeaten. 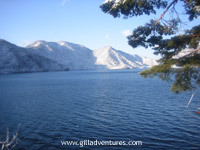 On this trip, we stayed first in a small Japanese Inn called the Sea Cliff in the little harbor town of Habu on the South end of Izu Oshima Island. It was somewhat westernized, and somewhat not; it had an onsen, and was, as a hotel, adequate yet unremarkable. The food on the other hand, was remarkable. Outstanding, really. 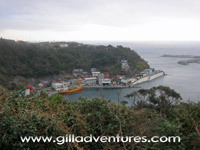 The hotel sat on the road directly above the little fishing port of the town. The owner spoke a bit of English, so even without my brother/interpreter with us we would have been able to get by. 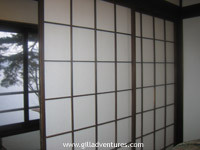 Rates at Japanese Inns are per person, and include both breakfast and dinner. Here in Habu, these meals were largely procured from the docks as the fishing boats came in. The hotel owner would buy what was fresh off the boat that day, and prepare a feast, which would be served a couple of tiny dishes at a time. One of our mornings there, we saw a woman collecting seaweed on the rocks just out of town, and joked that she was collecting our dinner. Only, it might have been true. The most memorable food we tried on this trip was natto. It is fermented soy beans, and the owner of the Sea Cliff had known a group of gaijin high school students who liked the stuff. I am glad to have tried it, an experience I will probably not forget. I actually liked the flavor. I did not like the fact that it stayed in my mouth for the rest of the day. Natto is sort of like small beans in snot. We mixed in some rice to cut the stickiness, but it still made long strings connecting our chopsticks to the plate with every bite, sort of like dozens of miniature strands of hot mozzarella cheese on a pizza. It coats the inside of your mouth with a film that is not washed away with tea or other foods. The only remedy is to brush the entire inside of your mouth with a toothbrush. Unfortunately, we did not realize this while we were still at the hotel where our toothbrushes were, and had to wait until returned at the end of the day.